Tore through four volumes of Shaman King. Now that the setup is pretty much done, it’s shonen battles, which means some long slugging matches are coming up. Might end up slowing down my pace just a tad. 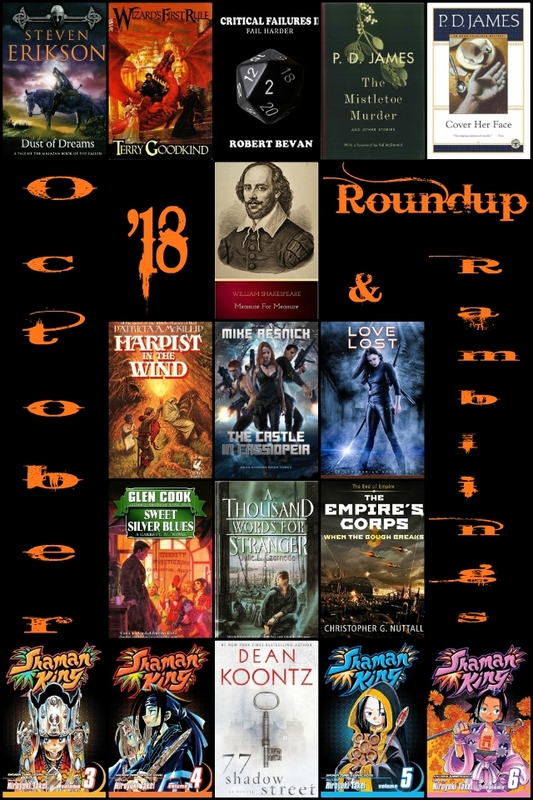 While I read a bit more this month, it was ALL crap. My average was below 3stars for goodness sake. I am thankful for at least one 4star book. Got Sick and kind of whimpered on for the last 10 days of the month. Didn’t read anyones posts, didn’t even reply to comments. Thankfully, that seems to be passing and I’m hoping to spring back into pure unadulterated Bookstooge Action this weekend with a Survival Saturday Post. Did a Tag and a 6Degrees post. It was good to write some non-review stuff. Especially considering all the crap books I plowed through and then had to write about. Surviving a Bad Book got some good numbers since I mentioned a book that a lot of people know. Always helps to stir the pot if everyone already has an opinion. Other than that, this was a rainy blah month that crept along like a whipped cur and then threw up in my shoes. I am so thankful October is OVER WITH. Once again, just like last month, no cover grabbed me and said “Worship me!”. 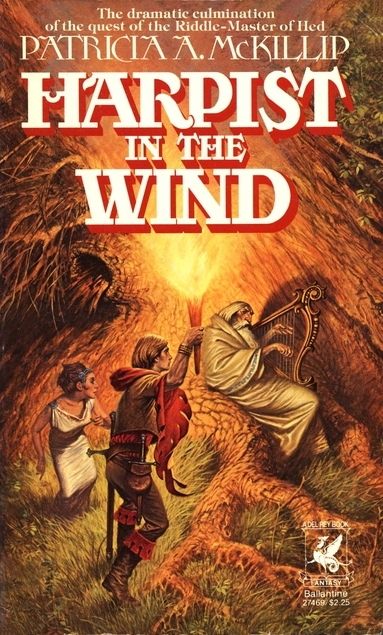 I am including the Harpist in the Wind cover because I feel it really shows Darrell K. Sweet’s style. He did so many covers over the years and once you learn what his stuff looks like, you simply can’t miss it. This entry was posted in Uncategorized and tagged 2018, Cover Love, Ipiccy, Ramblings, Roundup. Darrell really became known for his fantasy covers. Even non-fantasy people could see one of his covers and know it was a fantasy book. As YouKneeK said, I’m glad that you’re feeling better now. Also, that cover looks fantastic. Reminds me of one of those really, really old fantasy novels that smell really good. I’ve had those “all crap” weeks, and it’s so demoralizing! And I bet it felt worse because you were also sick. Still, 5773 pages this month, nothing to scoff at. Great job. Yum… sounds like a Survival Saturday opportunity! Glad you’re feeling better now! Ugh, I hate a month filled with crap books-it can easily drive you into a slump. Hopefully this month will be better! Huh, I never paid that much attention. Great, now I’m ever going to see is “purple” when I see one of his covers. You’re the best, cuz! Ugh shame your average was so low That’s disappointing. I hope November is a better month in every way! Glad to see you smoothly getting back into the game. Hope you won’t get struck down again for a while, and that good books wait upon you during this month. Happy reading, sir. It is amazing just how vulnerable we humans are. One little teensy tiny thing went wrong inside me and bam, I’m out of it.